KIEV, Ukraine -- Ukrainian President Viktor Yanukovych on Tuesday effectively ended the colourful four-year rule of Kiev's boss Leonid Chernovetsky, known as "Kosmos" for his other wordly eccentricity. 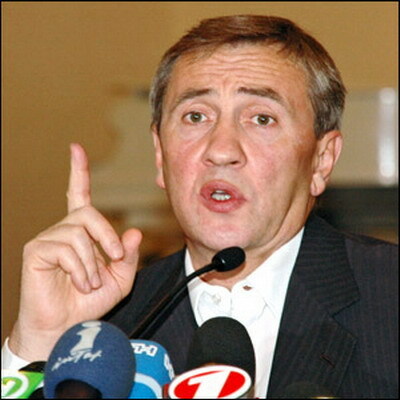 Fired Kiev mayor Leonid Chernovetsky. Yanukovych signed a decree removing Chernovetsky as head of the Kiev city administration and appointing top local official Olexander Popov in his place, a statement on the presidential website said. The move appears aimed at returning order to the sometimes chaotic capital as it gears up to host the final of the Euro 2012 football which will be one of the biggest events in the country's history. Chernovetsky was elected city mayor in 2006 and, by a quirk of Ukrainian politics, should formally retain the post of mayor even though he risks having no power if he does not control the city administration. The two posts are separate in Kiev, with the mayor being elected by popular vote and then appointed as city administration chief by the president. Chernovetsky had held both posts. "The president cannot fire him from the post of mayor, as that would exceed his powers," said top Ukrainian political analyst Volodymyr Fesenko. Prime Minister Mykola Azarov has said that Chernovetsky would now only carry out "representative functions and all management decisions will be taken by Olexander Popov and the cabinet," the Interfax-Ukraine news agency reported. By coincidence, the shuffle comes just weeks after Russian President Dmitry Medvedev fired the mayor of Moscow Yury Luzhkov after 18 years in power. Chernovetsky's four-year rule was highly colourful even by the standards of charismatic European big city mayors. Accused of suffering mental problems by his opponents, he once gave a press conference in a pair of swimming briefs and performed a string of exercises to prove his fitness. He also famously offered to put his kisses up for auction, recorded a song and wrote a book bluntly titled "How to Become a Millionaire". More seriously, his detractors have accused his administration of rampant corruption and expressed bewilderment at sometimes bizarre schemes to fill depleted city coffers like charging for parking spaces at cemeteries. Criticism against Chernovetsky mounted last winter when heavier than usual snow caused chaos in the capital, with ice wreaking havoc among pedestrians on Kiev's steep slopes and people wading through deep snow in the centre. Reports earlier this year said a thief made off with a handbag stuffed with 4.5 million euros in jewels belonging to his daughter on a visit to Paris but this was denied by the mayor's office. "Relations (between the president and Chernovetsky) deteriorated over the winter. Not for political reasons but because of the horrific situation in the capital," said Fesenko. "Confidence was lost in Chernovetsky not as a political ally but as a manager," he added. The move is the latest show of political strength by the pro-Kremlin Yanukovych who came to power earlier this year. Ukraine's constitutional court in October strengthened his powers by annulling 2004 amendments that boosted parliament, sparking opposition claims of creeping authoritarianism.